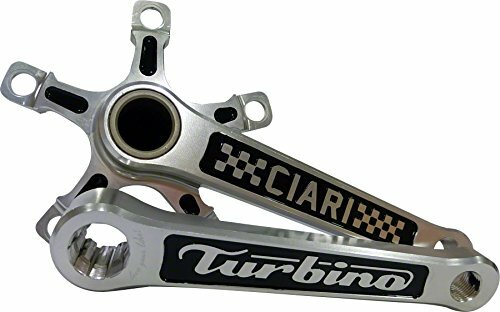 Turbino cranks are forged and machined from 6066 aluminum with Ciari and Turbino logos inlayed on the crankarms. Includes external sealed 24mm euro bottom bracket. 5 bolt 110mm spider. BB Included:Yes. BB Style:Euro. Bore:24. Color:Silver Arrow. Crank Arm Material:Aluminum. Crank Length (mm):160. Crankset Style:2-Piece. Defined Color:Silver. Spindle Material:Steel. Weight (oz):19.58.